The "Stand Your Ground" or "Shoot First" law that may protect the man who shot and killed 17-year-old Trayvon Martin in February is the template for an American Legislative Exchange Council (ALEC) "model bill" that has been pushed in dozens of other states. The bill was brought to ALEC by the National Rifle Association (NRA) and was unanimously approved by an ALEC task force co-chaired by Wal-Mart and stocked by other special interests. Additionally, the corporate board members of ALEC, like AT&T, Koch Industries, and Kraft Foods, help facilitate the spread of these laws by financially underwriting its operations. The Center for Media and Democracy (CMD) has compiled this list of resources to help reporters and other citizens expose ALEC and its agenda, as well as the long and close relationship between ALEC and the NRA. Nobel Prize-winning economist Paul Krugman recently highlighted CMD's work exposing ALEC in the New York Times, noting that exposing ALEC is a good way to start "taking our country back" from the "corporatization of our political life." CMD's infographic (PDF) shows some of the connections between the NRA, ALEC, and the effect of the ALEC/NRA Shoot First law. The NRA has been a long-time member and long-time funder of ALEC. An NRA representative has served on the Public Safety and Elections Task Force, and its predecessor Crime Committees, for many years. Tara Mica, NRA-Institute for Legislative Action State Liaison, was the co-chair of ALEC's Public Safety and Elections Task Force in 2008, 2009, 2010, and parts of 2011. While the NRA was co-chair, that Task Force approved the controversial "voter ID" bill and the Arizona anti-immigrant legislation, SB 1070, as model bills, in addition to other gun laws. The total amount the NRA has paid in membership dues to ALEC is unknown. In addition to annual fees, the NRA can pay a premium to be featured as a co-sponsor of ALEC meetings. For example, at last year's annual ALEC convention, the NRA was a "Vice-Chairman" level sponsor, which in 2010 equated to providing funding at the $25,000 level. But that is just one snapshot of donations from one part of one year, out of many. ALEC conventions also often promote shooting events for ALEC legislators and corporate lobbyists that are sponsored by the NRA. Information on the NRA's role in introducing the Florida "Stand Your Ground" law can be found in CMD's report: "ALEC Ratified NRA-Conceived Law That May Protect Trayvon Martin's Killer." 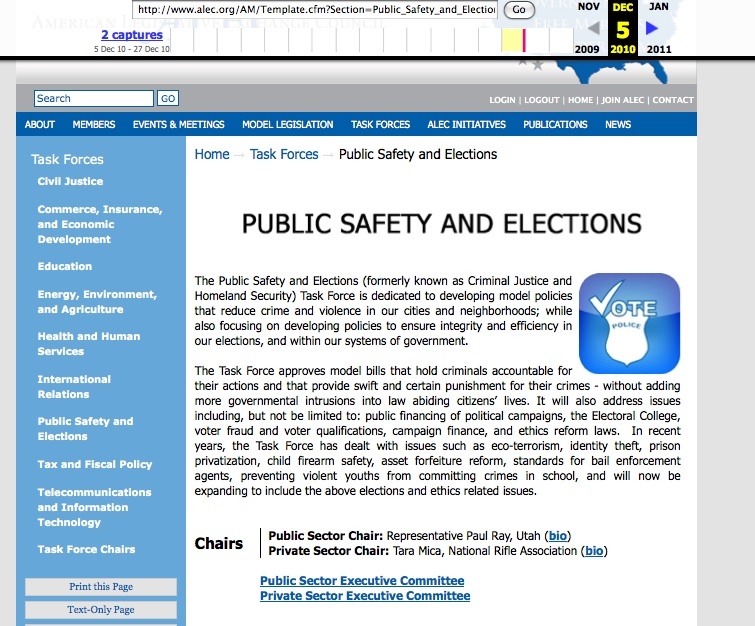 This article includes materials showing the NRA lobbyist standing behind Governor Jeb Bush while he signed the bill and screenshots showing that Wal-Mart was the co-chair of the ALEC Task Force that approved the bill, along with a contemporaneous report from the NRA that the NRA's proposal was well-received and "unanimously" adopted by ALEC's Criminal Justice Task Force of public sector and private sector members. ALEC also "scored" the bill, singling it out among numerous "model" bills, when it was introduced and passed, as noted by Common Cause. Additionally here is a "tick tock" or backgrounder on the trajectory of that bill in Florida and in connection with ALEC. "Faces of NRA/ALEC 'Stand your Ground' Law"
"The Corporations Bankrolling ALEC, which Has Promoted the 'Stand Your Ground' Gun Law as a 'Model' Bill"
"Groups Write to ALEC's Corporate Board Regarding Trayvon Martin"
MSNBC's UP with Chris Hayes interviewing CMD's Executive Director Lisa Graves. And, here is a joint letter from several organizations delivered at ALEC headquarters asking for the group to fully disclose its financial relationship with the NRA and to stop pushing these Shoot First bills as models. Additionally, national and state reports by Common Cause, People for the American Way, Progress Now, and others are available. CMD is sending letters to the corporate leadership of ALEC asking that they break up with ALEC, in light of the Trayvon tragedy. The Nation Magazine is taking a similar action, targeting ALEC corporate member AT&T, in particular. For additional information on ALEC's role in Florida's "Stand Your Ground" law or press interviews, please contact Lisa Graves (editor@prwatch.org) or Law Fellow Brendan Fischer (brendan@prwatch.org) at (608) 260-9713. Lisa Graves is the Executive Director of the Center for Media and Democracy, which includes ALECexposed.org, PRWatch.org, SourceWatch.org, and BanksterUSA.org. She previously served as Deputy Assistant Attorney General in the Office of Legal Policy at the U.S. Department of Justice where she handled gun policy and was the managing editor of the National Integrated Firearms Violence Reduction Strategy. She served on DOJ's gun policy team under both Attorneys General Janet Reno and John Ashcroft.